After a two-week regimen with a pro gamer training app, I’ve made a stunning transformation into… a slightly better Overwatch player. Dojo Madness, an app developer with a whopping $12.75 million in venture capital funding, has put out four different video game training apps for League of Legends, Dota 2, Counter-Strike: Global Offensive, and Overwatch. Each of the apps has the Japanese word “sumo” in the name, which translates to “rush towards,” perhaps in reference to how VCs seem to feel about esports apps these days (case in point: this well-heeled startup that broadcasts esports tourneys in VR, of all things). Of those four games, Overwatch is the game I hoped most to master, so I installed the “Oversumo” training app two weeks ago. Alongside Oversumo, I installed a bevy of fan-made Overwatch training apps from the iOS store. In comparison to the other independently developed apps of its genre, Oversumo stands out. The app is uncluttered and easy to navigate, which places it a cut above any of the competing Overwatch training apps I tried. The others are mostly jumbled lists of tips and links to tutorials online. Oversumo uses the API provided by Overwatch’s developers at Blizzard to pull statistics from both quick play and competitive matches. It tracks your progress and offers a tips and tricks for every Overwatch character. The core of the app is the statistics, especially Oversumo’s weekly progress report email about your recent matches. These progress reports, in theory, encourage you to stay in touch with the app and track your abilities and growth over time. Although Oversumo is a lot better than the other fan-made apps I tried, it did fall short of my expectations. When I heard “gaming training app,” I imagined something like my Fitbit: an app that would track how often I play, how well I do in matches, and… gamify my gaming experience, for lack of a better phrase. Admittedly, Overwatch already does gamify my experience by rewarding me for good behavior. I get medals, experience points, and the validation burst that comes with the occasional “Play of the Game” spotlight on me and my avatar. Overwatch also already offers me some statistics on my matches, as well as a ranking from Blizzard. So, what could I hope to gain from a secondary app? Those were the same questions I had about Fitbit before I got one: I already work out, so why do I need an app to pat me on the back for doing it? For whatever reason, entering my work-outs into the Fitbit app and getting the pleasure of seeing when I fulfill specific goals hits a psychological sweet spot for me, and given the wild success of Fitbit and its competitors, I know I’m not the only one. I expected Oversumo to scratch that same virtual reward itch, plus encourage me to play more Overwatch according to in-app recommendations. I also expected Oversumo to crack the proverbial whip on me by giving me a training schedule and gently chastising me when I skimp out on meeting its demands. I wanted a virtual personal trainer for my gaming, just as I already have for my work-outs. Sadly, Oversumo doesn’t do that, but it’s still in beta and the developers may well add more virtual whip-cracking. The Oversumo website does hint at some future plans, such as upcoming sections about “detailed map analysis” and “team compositions.” On the app’s official subreddit, an Oversumo staffer wrote that the app’s “next big update” would include “social features” as well. Compete reached out to the Oversumo team for more details about these updates but did not hear back before press time. I haven’t logged a ton of hours into Overwatch (yet), but I have a lot of experience with other team-based shooters (e.g. Counter-Strike, TF2) and want to take my game to the next level. However, I don’t think Oversumo is designed with someone like me in mind. The app revolves primarily around statistics, which become more useful the longer you use the app. It’s much easier to track your progress and see your strengths if you have a massive glut of data to analyze, which I have yet to generate. There’s the occasional typo, but Oversumo is nice to look upon. I read all of the tips for my preferred character, Reinhardt, and they seemed pretty simple—almost too simple, such as the tip, “Know where your teammates are!” Then I read some of the tips for other characters that I haven’t played as often, like McCree and Ana. Some were equally straightforward, like the McCree tip that advises me to use his Combat Roll move “as an escape, gap closer or to obtain a better angle for Deadeye.” Other tips seemed harder to interpret, such as this Ana tip: “Make sure your team knows how to deal with people you used Sleeping Dart on. Only hit them if they can be killed and only if there is no better target at the moment.” That last sentence feels like a brain teaser. Only use your Sleeping Dart on targets who can be killed (meaning: targets who are close to death? I’m not sure about this one), unless there’s a “better target” (like what? How would I tell?). This was around when I started to wonder if maybe I wasn’t good enough at Overwatch to use Oversumo. Maybe there was something about this app that I was missing and I just hadn’t played long enough to see what it was that would help me out. “Demonstrably untrue,” according to one of my Overwatch personal trainers. Luckily, I have several friends who are incredible at Overwatch. I reached out to my friend Nico, who’s written for Kotaku before about Overwatch, and asked her to install the free app and see how it judged her. 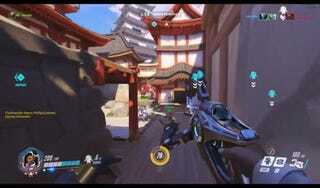 Right away, she uploaded a picture of one of the game’s Symmetra’s tips and declared to to be “demonstrably untrue.” The tip in question reads, “You have unlimited ammo so don’t be afraid to spam. 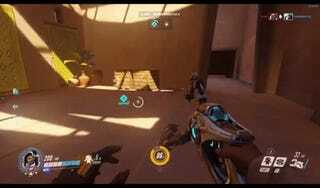 Prioritize corridors and corners to maximize the chance of success.” Symmetra’s right and left-click energy beams do not have unlimited ammo. “It’s hard to notice because it’s a huge clip and she’s not reloading a gun,” Nico explained. “But your beam does run out. At no point has she had infinite ammo; I checked patch notes. You spend it until it’s gone and reload, like every other hero.” Luckily, Nico didn’t think all of the gaming tips in the app were inaccurate, but ideally, none of them would be. While I had two personal trainers—err, friends of mine—available to chat with me about Overwatch, I decided to take advantage of the opportunity to ask them what types of gaming tips they would offer me, since Oversumo didn’t seem to be doing much good. Nico pointed me towards Overbuff, a fan-made statistics website. Like Oversumo, Overbuff offers an impressive array of statistics and tracks your progress over time. One notable difference is that Oversumo tracks your stats per in-game life, whereas Overbuff tracks your average stats per game. Plus, Overbuff doesn’t include the option to get weekly progress reports emailed to players, nor does it offer any gaming tips or counter-picks. Basically, it’s just the statistics and nothing else. Another great moment featuring by one of my two Overwatch personal trainers, via her Forge account. After talking to Nico and Ian, and after looking at Oversumo’s tips one more time, I hopped back into Overwatch to see if any of my skills had improved. I think I was playing better, although I didn’t notice any big statistical differences. I definitely wasn’t winning every match or even getting “Play of the Game” any more often than before I installed Oversumo. But I felt happier and a lot more confident, probably due to the added psychological benefit of having apps installed and advice from friends in my back pocket. As soon as I wrapped up my matches, I found myself idly refreshing Oversumo and my brand new Overbuff profile just to check my stats. After comparing my second week in Oversumo to my previous one, I realized my shielding abilities had jumped from a “Gold” to a “Platinum” ranking—but none of the rest of my ability scores had increased significantly. I may not be improving much at the game, but I have found a new way to obsess about how well I’m not doing. In the marketing for Oversumo, the developers boast that “big data” is what provides players with their overall rankings. The app attempts to sort you into a ranking just the way that Blizzard does, although the Oversumo ranking compares you to other Oversumo users. For the player who feels like their Blizzard ranking isn’t fair, the Oversumo ranking might feel more accurate—especially if it’s complimentary. But does it really matter if Oversumo thinks you should be in the Platinum rank, if Blizzard still thinks you belong in Gold? And if Oversumo ranks you even lower than Blizzard does (as happened to my friend Ian), what do you even do with that information? For me, my literal ranking doesn’t matter so much; I just want to feel like I’m improving. I want to become a better player, and I hoped this app would give me a more defined path towards becoming one. I wanted a grueling training regimen, a list of specialized drills to practice, and a weekly schedule with reminders, especially when it comes to completing the more boring but ultimately educational tasks like running a drill or two at the shooting range. Overwatch won’t give me a gold star for doing that, but maybe Oversumo could. I think there’s room in the market for an app that does this. But for the moment, Oversumo doesn’t seem to be designed to “train” anyone to do anything. It just charts where you’re at now. The discipline is still up to you. Oversumo still did convince me to play Overwatch more, simply for the sake of seeing my statistics update. But I don’t think that’ll work for longer than another week or two. The weekly reports that I received did not provide me actionable information. Hearing about my accuracy percentage doesn’t tell me much, except “be more accurate.” There’s no answer to the question of “how?” The fact that I knew the percentages existed made me want to play more in an effort to improve them, so that my next weekly report would feel less embarrassing, but since I had no idea how to improve at any one area, I… didn’t actually improve. In my own efforts at weight-lifting, I’ve learned that obsessing about numbers doesn’t tend to help me. I can fall down a rabbit hole of marking my progress and I get very frustrated when I plateau. In weight-lifting, if you hit a plateau, the recommendation most trainers will tell you is to switch to another form of exercise and change up your schedule. The same is true for gaming, at least in my experience. If you hit a plateau, then maybe it’s time to try something wildly different: a new character, a new style of play, or a wacky strategy. You have to split the difference between running repetitive drills for the sake of “staying in shape,” versus trying new stuff to get better. Oversumo doesn’t offer that type of advice, nor does it offer the specialized advice that my own friends were able to provide to me when I asked. But I think it could. Even if it did, though, I think I’d have to follow that advice for longer than two weeks to see a difference. I’ll check back in with all of you in a year. I’m sure I’ll be a pro by then.